What Printer to Buy ? You are here: Home / / Products Launch / What Printer to Buy ? Brother Brand. Currently, it is the DCP-Jseries printer using LC39 ink cartridges. On the average, one ORINK compatible ink cartridge XL version cost about $5/pc. Each cartridge should enable you to print approximately 900pgs. HP / Canon / Brother Brand. 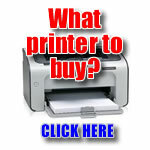 These are the printers that will enable you to lower your printing cost. On the average, one ORINK compatible laser toner cost about $30-35/pc with promotion. Each cartridge should enable you to print approximately 2000pgs. This is purely our recommendation. Stick to your favorite printer brand if cost is not an issue. We are not related to the printers manufacturer. Refill or New Cartridge ?